• Combines the benefits of aerodynamic shaping with a balanced lightweight club construction for more consistent distance. 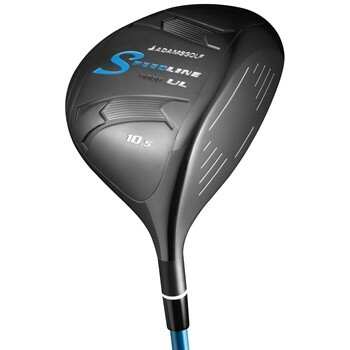 • 11.7 percent straighter compared to other lightweight drivers. Like any golfer, Adams Golf believes the problem isn't in the swing, it's in the clubs. The company’s founder is a man named Barney Adams who started Adams Golf in 1987. Mr. Adams had built a career in golf manufacturing as a component supplier and contract manufacturer. He benefited tremendously from his experience custom-fitting golfers, and used those opportunities to observe the effect a variety of materials and head designs had on golfer’s performance. Applying the lessons learned in that process, Adams developed and introduced the Tight Lies fairway wood. Tight Lies had what has become known as an “upside down” head design. This innovative design became somewhat of a phenomenon in golf and still enjoys tremendous customer loyalty. (7 years after it’s introduction hundreds of thousands of golfers still have Tight Lies in their bags.) Adams product line is by no means limited to Tight Lies fairway woods, as the company produces and sells a full range of product including drivers, wedges, putters, hybrid irons and more. In addition to endorsing its products, pro golfer Tom Watson assists in design and testing.